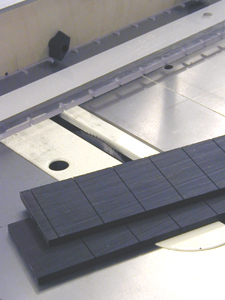 Instrument design is a constant challenge of pushing the envelope to produce a more efficient guitar. I believe that while actual body shapes and designs are somewhat important the accuracy and quality of the construction is perhaps even more critical. So with that in mind I'll offer a little insight into some of my designs, construction techniques and various shop jigs & tooling. An individual builder has much greater freedom to experiment with designs than a factory might. Factories must concentrate on production methods and achieving consistent results from a huge range of type and quality of materials. 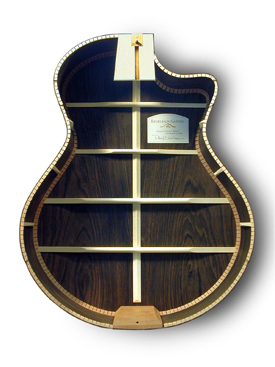 Additionally, most factory guitars are also overbuilt in the interest of minimizing warranty claims. In fact, I believe most guitars are overbuilt to some degree....the trick is finding the right balance between durability and sound production. You really can have both. 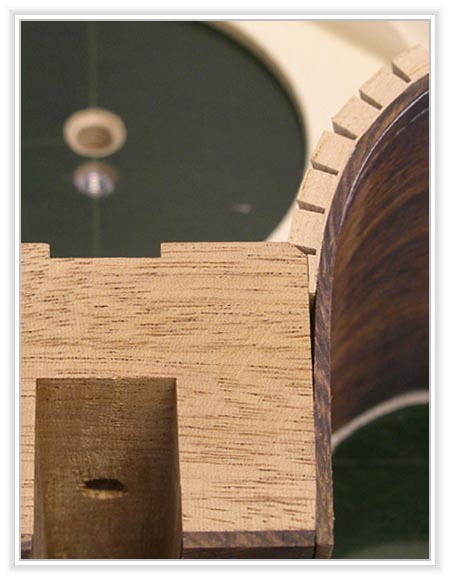 Traditional dovetail neck joints are a perfectly adequate way to attach a neck. 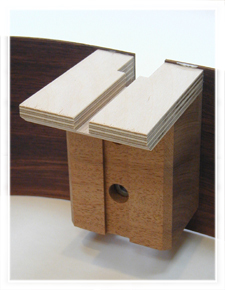 However, I find that employing a full 3/4" slip-fit mortise and tenon joint offers significant advantages. First, the bolt-on design enhances stability and vibration transference thru the use two mechanical fasteners that pull the heel snugly into the neckblock and against the guitar sides. Second, this method improves the accuracy of manufacture. Neck angles can be precisely set (or re-set) without disturbing the strength of the joint since no glue surfaces are affected by changes. 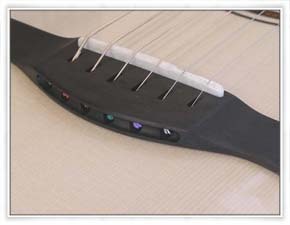 Third, the neck is easily removed by loosening the fasteners and lifting the fingerboard from the top in the traditional way. This can be accomplished in less than fifteen minutes with no worry of damage from "steaming" the joint apart. 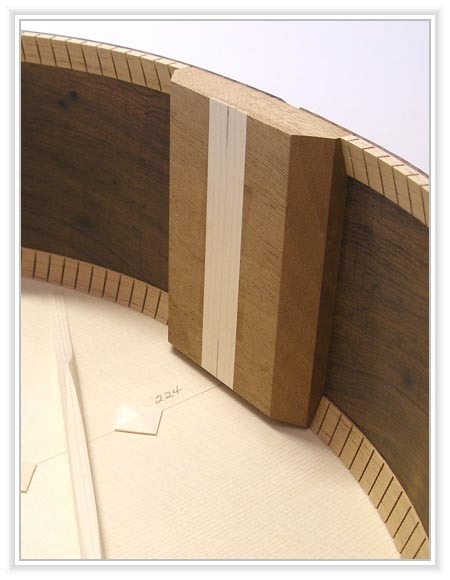 Shown here is the neckblock with a birch ply paddle. 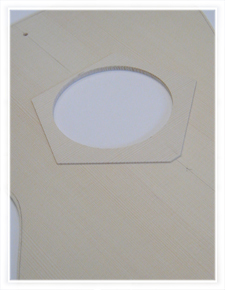 The ply material is used because of its inherent strength to weight ratio. It is stronger and more stable than either mahogany or spruce, both of which I have tested. 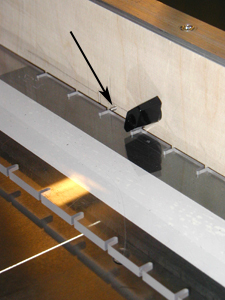 The paddle provides complete support for the fingerboard area and will ultimately provide a platform for small bolts which replace the function of glue in holding the fingerboard snug onto the soundboard. Also visible on the neckblock is one of the countersunk bolt holes used for neck attachment. As a final touch a matching mahogany filler strip is fitted into the channel to hide the bolt heads. A cross-grain patch of matching spruce is used to support the underside of the rosette area and prevent distortion of this weakened area. Not shown in this picture are the additional two braces added on either side of the patch or the X-brace and upper transverse braces. 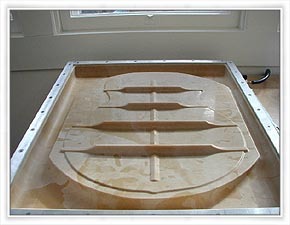 Classical makers use a similar support patch as a matter of tradition. The new Pin-less bridge is now available as a "standard" feature if requested. Designed with CAD CAM technology, the new bridge is machined on a Fadal CNC machine for accuracy. I probably employ as many jigs and fixtures as any independent builder out there today, maybe more. But no matter how many jigs you have guitars are still incredibly labor-intensive. The use of Jigs and fixtures simply allows for more accurate and consistent parts construction and more accurate body and neck geometry. Tradition has an important place in guitarmaking, but if I find a better way to do something, or a material or technology that makes a better instrument then I'll certainly use it if the result is a better guitar. 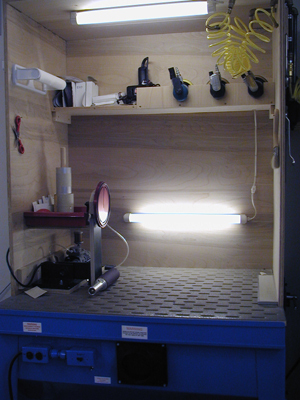 One of several jig "carts", and a Vacuum Gluing Press made here in the shop. 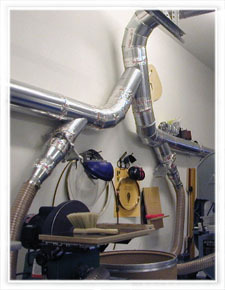 Dust collection in dedicated machine room is handled by a two-fold system. 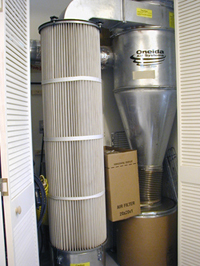 Smaller operations such as neck and body sanding are performed within a custom designed downdraft cabinet safe from harmful wood and finish dust. 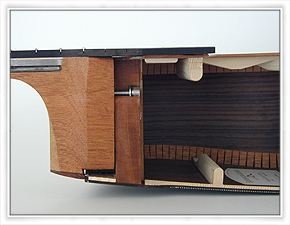 Bodies are safely cradled in a vacuum holding fixture that can be rotated for complete access to the guitar's rims. Orbital air sanders make quick, safe, and accurate work of leveling wood and bindings. 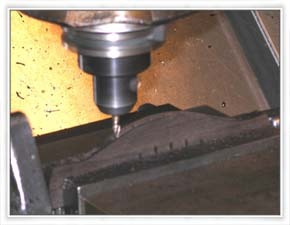 Larger shaping operations and rough wood milling is done on traditional woodworking machines, all of which are connected to a central Cyclone type system. Sometimes the details you can't see are the most valuable, or perhaps just the most interesting. Here are a few examples. In this view you can see the care with which I tuck the kerfed linings into the neckblock. Not only does this "lock" everything together more solidly, it also provides a sound bed for the body's binding to ultimately lay in. Here I have improved on an idea I got from vintage Martins to prevent the tailblock from splitting. While many builders today simply use birch ply for this part I think a more elegent solution is to inlay a strip of cross-grain maple. 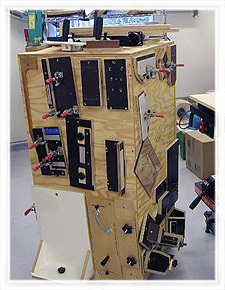 It also serves as a solid platform to install an endpin jack.